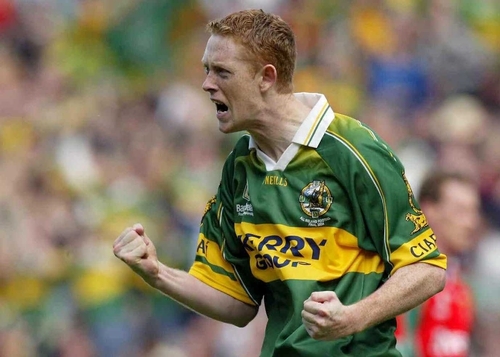 All-Ireland champions Kerry easily cleared the first hurdle of their 2005 campaign as Eoin Brosnan and Colm Cooper both netted in their Munster SFC quarter-final defeat of Tipperary on a scoreline of 2-22 to 0-13. The Kingdom reigned supreme in the opening exchanges in Thurles with two Mike Frank Russell points, added to by Liam Hassett and Brosnan, putting them 0-04 to no score in front after 8 minutes. Tipp had to wait 20 minutes before lynchpin forward Declan Browne opened their account. Browne slotted over the Premier’s only other scores, two frees, of the first half as they trailed 0-03 to 0-12 at the break. Brosnan’s punched goal on the restart, after Russell’s instinctive shot had rebounded out, put the decision beyond doubt, despite a strong final quarter from the home side. Benny Hickey, Fergal O’Callaghan, captain Browne and Liam England shared out the Tipp points, with 2004 All-star Cooper notching a second goal for Kerry, who started without Seamus Moynihan at half-back, on 53 minutes. Jack O'Connor's men next face Limerick, whom they beat in last July's replayed Munster decider, on Sunday, June 19.